Why is it nonsense when WE say it, but reasonable when THEY say it? I’ve rarely read such nonsense and lack of understanding of the evolutionary process. Academic prejudice hinders the advancement of science because prejudice causes scientific journals to ignore and/or reject discoveries. In our case, the research concerns the breeding of race horses. Here’s how it all went down. 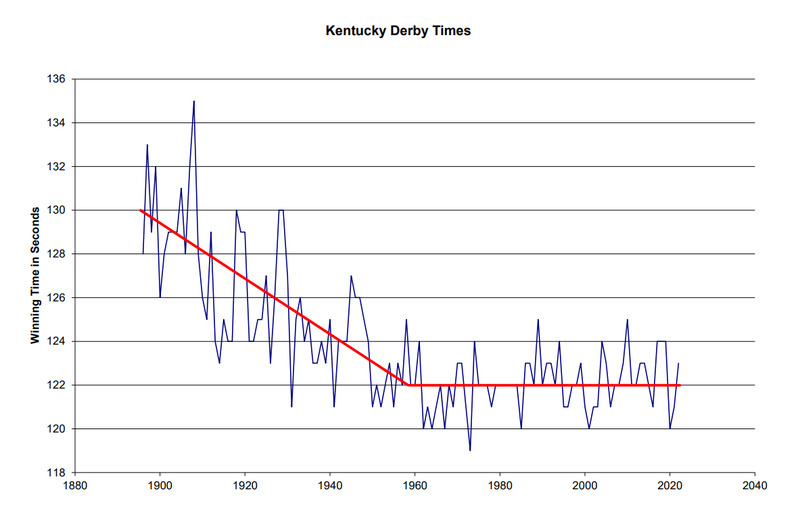 Although we did not call breeding an “arcane strategy,” we came to the same conclusion in our June, 1999, article, “The Kentucky Derby Limit.” 5 What’s the difference? Our plot of winning times from 1896 up to 2014 shows the same thing. We agree with his comment about track conditions. It is also coincidental that he compared the breeding of horses to the breeding of cows, just as we did. If there is any difference at all between the “nonsense” we wrote, and what he wrote, it might be here. He seems to be saying dairy farmers do a better job of selective breeding than horse breeders do (but he doesn’t say how). Thoroughbred racehorses have become so inbred that they are almost identical genetically. Since they are genetically identical, they will be physically identical. The only way to get horses to run faster is to get some “new blood” into the gene pool. Of course, he is right about that (if that really is his point). That certainly is our point. Evolution requires the addition of new genetic material. As long as the gene pool stays the same, the creatures coming out of that pool will stay the same. The only way for horses to improve is for new genetic information to be added to their genes. With today’s technology, it might be possible for a gene jockey to replace sections of horse DNA with genes taken from a cheetah or greyhound, which might make them run faster. Some people might consider that unethical (for sporting, rather than religious, reasons). A more traditional approach would be to let California Chrome have his way with a Clydesdale mare to produce a faster colt. But Kentucky Derby breeders don’t invest in mixed-breed racehorses for one of two reasons. Either (1) they know from experience that it is a stupid idea that won’t work, or (2) they are too narrow-minded to try. We suspect it is the former; but Roberts might think it is the latter. The Modern Synthesis (currently the most widely believed version of the theory of evolution) says that new information comes from random mutations. If that were true, then new mutations would continue to arise spontaneously, making thoroughbred racehorses faster and faster every year. But the Modern Synthesis isn’t true, which is why horses have reached the Kentucky Derby Limit. Breeders could help the evolutionary process along by focusing strong x-rays on California Chrome’s testicles, increasing the number of mutant offspring, just like some scientists have done on fruit flies. Of course, they aren’t going to do that. Horses don’t reproduce as rapidly as fruit flies, so there isn’t time to wait for a successful mutation. Furthermore, countless mutant fruit flies produced this way have not exhibited any remarkable improvements in fruit flies, so there is no reason to believe that they could produce a faster racehorse no matter how long they tried. Breeding horses is more expensive than breeding fruit flies. It takes more faith to believe with your pocketbook than it does to believe with your mind. Breeders don’t intentionally randomly mutate the genes of their fastest horses because they don’t really believe in the Modern Synthesis (that is, evolution). The undeniable evidence is that there really is a limit to how much the characteristics of a particular species can vary. Racehorses have reached the limit of how fast they can run. More to the point, that limit prevents fish from evolving into amphibians, or reptiles evolving into birds or mammals. Yes, evolution can produce minor changes that may become established in a population, but no, evolution cannot proceed without limit to create new kinds of creatures.